I started doing iPad demonstrations and workshops in the summer of 2010. 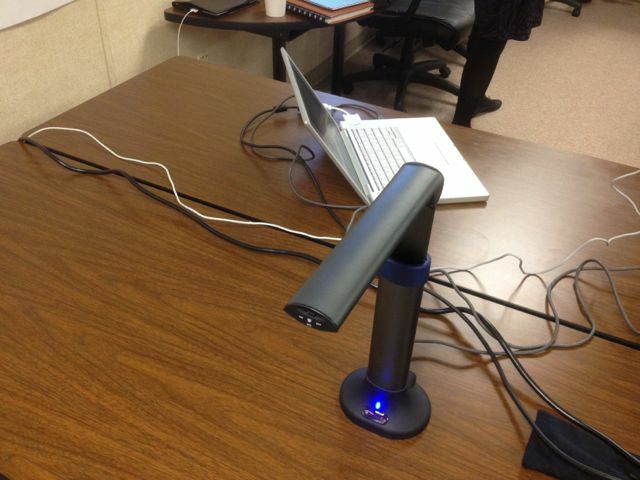 In previous posts, I wrote about using the IPEVO P2V USB camera. As you may know, the original iPad did not have video mirroring, the capability to project whatever is on the iPad screen. You could show iPad content only through apps and only a handful of apps supported the video out function. So until the iPad 2 arrived with full video mirroring, I used and traveled with the IPEVO P2V to show and share what was on my iPad screen. Since purchasing my iPad 2, I’ve used the VGA adapter, Digital AV Adapter (HDMI) and most recently, Apple TV & AirPlay to project iPad content. Though I’ve had little need lately to travel with the IPEVO, I did make good use of it in my home office. When I first began recording iPad video tutorials last year for my new, online iPad Academy Master Class for beginners, I used the IPEVO. After recording about half of the 21 videos in the series, I discovered the HoverCam T3 USB camera. I contacted the company and they were kind enough to send me a T3 unit for review. I’ve been using the HoverCam for the last few months, demonstrating it at teacher workshops, and using it to complete the training videos for the Master Class. Though the T3 costs nearly three times as much as the IPEVO P2V ($220 vs $70), the quality and versatility of the HoverCam makes it a good value. 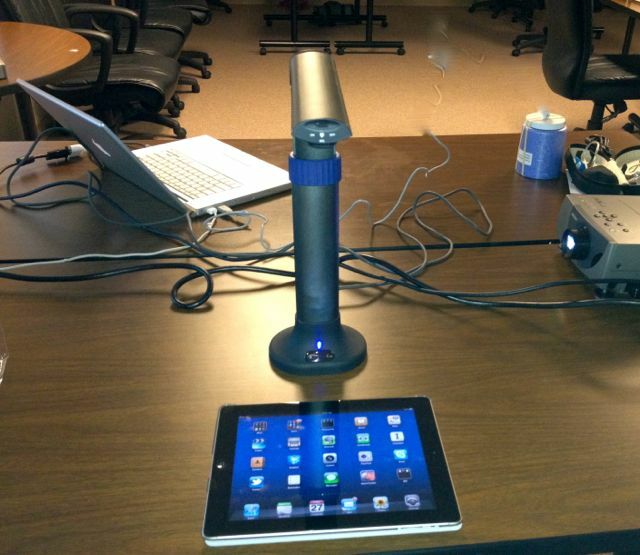 The HoverCam is now my favorite tool for recording and projecting iPad content. The HoverCam T3 is a clever, tower design, with a small but steady base for support. Standing 14 inches (36 cm) tall when collapsed, the unit telescopes to 21 inches (53 cm) when fully extended. The adjustable height made it easy to capture my iPad screen at just the right size for recording in QuickTime on my Mac. 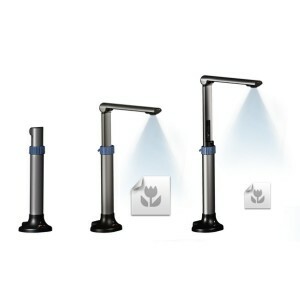 Powered by USB, the flip-up, 3 megapixel camera arm includes a lens focus ring, microphone and bank of 6 LEDs to illuminate the object viewed. The microphone and light panel can both be turned off if desired, or you can choose a different microphone input via software. So this HoverCam is a telescopic, 3 megapixel device, hence the “T3” name. Besides being a high quality video camera, the HoverCam can project clear images of documents, clippings, and 3-D objects. The T3 can also act as a scanner to digitize documents and save the resulting file in a variety of formats. 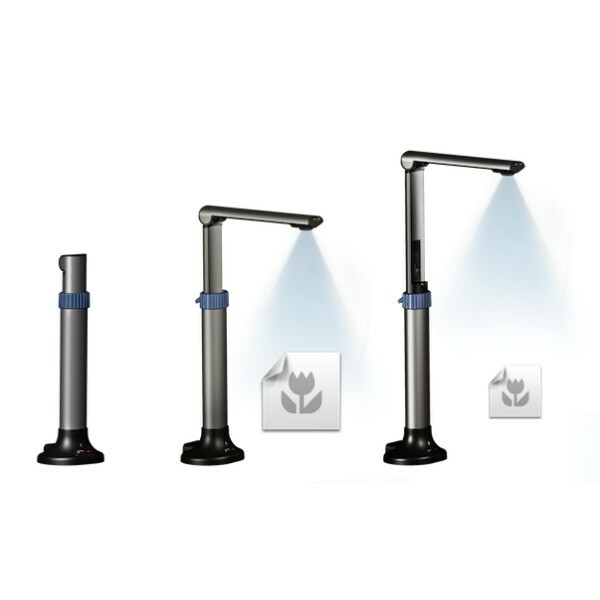 The HoverCam works with Windows or Mac computers and includes software to adjust the image and manage what you capture. I recommend you check the website for the latest versions of the included software or new releases by the company. As I mentioned above, I used the HoverCam T3 to complete the Master Class series and improve video quality. Though the IPEVO P2V is a fine camera given the price, the T3 offered improved resolution, higher frame rates and better detail. I also employed the HoverCam recently during an online videoconferencing session using Skype. If you need a portable solution to project the iPad screen, paper documents or 3-D objects, you should definitely consider the HoverCam T3.